President Donald Trump's faith is once again being questioned, this time by fellow Republican, and one-time friend, "Morning Joe" co-host Joe Scarborough. Scarborough's comments came shortly after co-host Mika Brzezinski teased a recap of Trump's meeting with Pope Francis on Wednesday, asking, "They didn't actually see eye to eye during the presidential campaign, so what happened during Donald Trump's meeting today with Pope Francis?" "We'll go through that and what drove them apart in the first place," Brzezinski said just before Scarborough quickly landed a sharp jab before the MSNBC show cut to break: "Well, the pope's a Christian." U.S. President Donald Trump arrives at the Quirinale Presidential Palace downtown Rome, Italy May 24, 2017. Italian Presidency Press Office/Handout via Reuters ATTENTION EDITORS - THIS PICTURE WAS PROVIDED BY A THIRD PARTY. FOR EDITORIAL USE ONLY. U.S. President Donald Trump shakes hands with Italy's President Sergio Mattarella at the Quirinale presidential palace downtown Rome, Italy, May 24, 2017. Italian Presidency Press Office/Handout via Reuters ATTENTION EDITORS - THIS PICTURE WAS PROVIDED BY A THIRD PARTY. FOR EDITORIAL USE ONLY. While Scarborough has been a harsh critic of the Trump administration thus far, recently slamming the president's new budget proposal as "hateful" and "mean-spirited," he is not the first person to cast doubt on the president's religious beliefs. 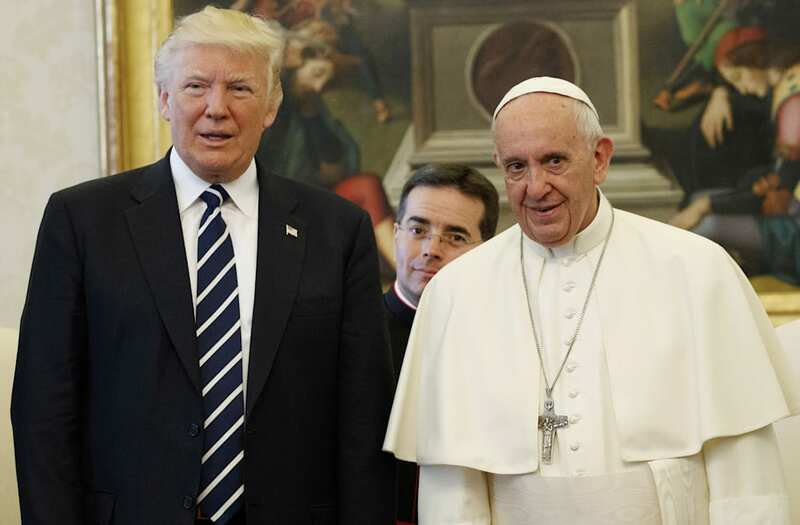 The pope himself, during the 2016 presidential election, suggested Trump "is not a Christian" saying, "A person who thinks only about building walls, wherever they may be, and not building bridges, is not Christian. This is not the gospel." Trump immediately rebutted, saying Francis' comments were "disgraceful." "No leader, especially a religious leader, should have the right to question another man's religion or faith," Trump said. The Vatican later backtracked the pope's remarks saying, "In no way was this a personal attack." A few months prior to the pope's controversial statement, the president came under fire after not citing a favorite Bible verse after being asked during an interview with Bloomberg. "I wouldn't want to get into it. Because to me, that's very personal," Trump said. "The Bible means a lot to me, but I don't want to get into specifics." The president later said his favorite verse is "eye for an eye." During the president's meeting at the Vatican on Wednesday, the Pope gave him a small sculptured olive tree that symbolized peace, a signed copy of his 2017 peace message and a copy of his 2015 encyclical letter on the need to protect the environment from the impact of climate change. The president gifted the pope a signed boxed set of five first-edition books by civil rights leader Martin Luther King. What would it look like if President Trump is impeached?